Our God is SO good! He is always telling us to “fear not” and to “rest in Jesus.” He doesn’t want us to fear death or fear for those who have died. But God doesn’t call it, “Death.” Believers don’t die; they “Fall asleep in Jesus.” We will see them again! He so wants us be at peace and, above all, be assured of the greatest hope of all! And what is our great hope? 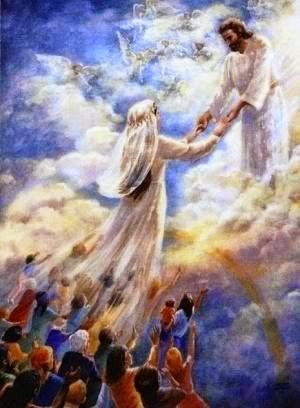 That at the appointed time HE WILL COME FOR US, His Bride! He will raise the dead in Christ first and PHYSICALLY transform them. Then, the rest of us who are alive and remain, will also be transformed in the twinkling of an eye and we will be caught up together with Him in the clouds. But best of all, WE WILL BE WITH HIM FOREVER! Notice the verse says nothing about anyone’s faithfulness…or lack thereof…level of commitment…or lack of it, and nothing about being “awake.” There isn’t even any mention of faithfully serving the Lord. The ONLY criteria for who goes up, BY THE WORD OF THE LORD, is that they are believers who have died in the LORD or believers who ARE ALIVE AND REMAIN. Our physical bodies will be changed in an atomic second, to be just like His. Now you see us: NOW YOU DON’T. These mortal bodies will put on immortality! No more death, no more sickness, no more disease, no more boredom, no more pimples, no more NOTHING. Nothing but intense, everlasting peace, joy and perfect health! This cannot referring to “spiritual salvation.” You can only be born again once in your life. That being so, Paul can only be speaking of the transformation of our PHYSICAL BODIES. Western cultures have a very limited understanding of the word, “salvation.” We’ve been brought up to believe it only refers to being saved from eternal damnation. While that is certainly included, salvation means far more than simply saved from hell, as awesome as that is! The word for “salvation, in Greek is a very rich word: “Sótéria.” It means “welfare, prosperity, deliverance, preservation, salvation, safety.” You are not just saved spiritually but saved or preserved from physical harm as well. If you have already been spiritually born again, the only part of you left needing salvation is your physical body and you soul, i.e. mind. When we see Jesus again, we’ll be changed from only being resurrected spirits in unresurrected bodies, as we now are, to being “LIKE HIM,” as He “IS,” in His eternal, glorified, PHYSICAL BODY! Anybody out there seen Jesus walking around in the flesh? Me either. But God knew that some folks would come along claiming Jesus returned “secretly” or in “spirit.” So, the Holy Spirit went to great lengths to emphasize Jesus would return “BODILY:” IN PHYSICAL FORM. Has All Prophecy Already Been Fulfilled? Some scoffers out there maintain that ALL prophecy was fulfilled as of 70 A.D. That is so far from accurate it isn’t even funny. NO. ALL PROPHECY HAS NOT BEEN FULFILLED. Not even close! Below are just a few important prophesied events that DEFINITELY weren’t fulfilled before that date. In fact, these listed below are still future. While the word, “Rapture” itself is not actually found in scripture, the concept most certainly is. The same can be said of the word “Trinity.” It also does not appear in the Bible, though our God is most assuredly a Triune God! The concept is no less scripturally sound. This mind-blowing event that 1 Thessalonians describes looks NOTHING like the one in Revelation 1:7 detailing Jesus’ second coming. In the “Harpadzó,” NO ONE WILL SEE US LEAVE. Jesus will just come mid-sky, He will shout for us and we will go up. Like Enoch, who is a typology of the rapture generation, EVERY BELIEVER will suddenly just disappear, to the amazement, confusion, and dismay of those left behind. In the Hebrew text of Genesis 5:24, just like they went looking for Enoch, so they will search for us, but we “Won’t be found.” They may even chalk it up to alien abduction. At the Second coming, unlike the rapture, there is no question: EVERY EYE WILL SEE HIM! No one on the planet will miss or mistake this event. It isn’t anything like the other return in the passage from 1 Thessalonians. There is no mention of Jesus, anything or anyone being seen. Just very suddenly, a great disappearance. The second coming, on the other hand, will be a terrifying and magnificent event. Not everyone will be cheering, of course. Most will be completely dismayed except, of course, for Israel. She would have been completely destroyed had Jesus not returned in the nick of time to rescue her. You see? That doesn’t sound anything like the rapture event. These are obviously two separate and distinct events. Then there’s the “little” matter of the missing dead people. Those who have died in Christ will be raised to life and disappear with those who will be raptured while still alive. They’ll leave behind a lot of empty graves. So #1: Either we all missed something…..OR…..#2: THIS EVENT HASN’T HAPPENED YET EITHER! #4) Forever With The Lord. It is also documented that we shall “Forever be with the Lord.” Now remember, Jesus now has a physical body. He eternally remains both God and Man. If we’re going to be “forever with the Lord, that means we will be PHYSICALLY with Him. I’m pretty sure that has happened yet, either. Last time I looked, He’s still PHYSICALLY in heaven and we’re still PHYSICALLY here on earth. Wow! That’s four prophetic events yet to occur. And what about our incorruptible bodies? Anyone out there been made immortal yet? No? Oops, there’s five events! Come on people. It’s ridiculous to assume that all prophecy was fulfilled in 70 A.D. The nation of Israel is ample proof, in midst of a host of others, disproving that statement. There are many prophesied events in regard to Natural Israel that began happening in the 20th century, like the holocaust and the birth of the state of Israel. For a WHOLE LOT MORE on that topic, things that will blow your mind, follow the link below. You will be amazed at how the Book of Psalms lines up with events that happened in the 20th century, particularly in regard to Israel. These are only five events prophesied in scripture, not counting the article on the 19th book, Psalms, that took place after 70A.D. And there are many, many more. That should put to rest the belief or teaching that all prophecy was fulfilled in 70A.D…..I hope. Know what that means, Church? The best is yet to come! In the 1 Thessalonians passage, there is also no of any mourning. Is this clear? I reiterate: THESE, QUITE OBVIOUSLY, ARE TWO SEPARATE AND DISTINCT EVENTS. These scoffers have managed delude more than a few Christians into thinking that Jesus has already come…secretly or in spirit…and that all prophecy has already been fulfilled. Sadly, this belief robs those who hold it of that which Paul did not want us to be ignorant. Now let me think?…….Who is it that wants to steal, kill and destroy? Oh, yeah…..the devil. He hates God and, therefore, us who are made in His image. He hates God so much he’ll do anything and everything he can to hurt man, whom God loves, and prevent as many as possible from coming to the knowledge of the truth. He especially hates Israel and the Church! Since he cannot prevent you from going to heaven, he wants to see you down, depressed, defeated and of no good to the furthering of the kingdom and, hopefully, to get to heaven faster. He doesn’t want you looking up or knowing who you are in Christ. NO! He knows that when you REALLY come to know who you are in Christ, HE’S TOAST. Why Has God Delayed His Coming? It’s just like in the days of Noah. He was a righteous man who tried for 120 years to warn people, tirelessly preaching the gospel to ears that refused to hear. They laughed at him right up until the day the LORD came shut the door…..and judgment fell. Then, it was too late. God is a good God Who’s heart is kind beyond all measure! His mercies endure forever! Even at this late hour He is still extending His hand to all men, as sinful and rebellious and unrepentant as they are, because HE IS WILLING THAT NONE SHOULD PERISH. He could wipe them all out in an instant if He wanted to, yet still He withholds judgment until the very last possible moment. However, He’s a great Respector of your free choice. He won’t force either salvation or protection on anyone, even if it means you choose not to live with Him forever in heaven. You’ll be, uh, well…somewhere else. Forever. Why raise the nation of Israel? Because He wanted to have a nation that would serve as an example of His grace and favor on their lives. His intention was to provoke the nations of the world to leave their idols and seek the true God. That has now been reversed. God is using the Church to provoke Israel to jealousy so that she will turn and accept her Messiah. “He came to His own, (the Jewish People) and His own did not receive Him. But as many as received Him, to them He gave the right to become children of God, to those who believe in His name: who were born, not of blood, nor of the will of the flesh, nor of the will of man, but of God.” John 1:11-13. But despite her rejecting Jesus, God has not forgotten Israel! He Who watches over her neither slumbers nor sleeps! And heaven help the nation that tries to harm the apple of His eye. His natural family are represented throughout the Bible as “the fig tree.” This typology is never a portrayal of the church. THE FIG TREE PUT FORTH NEW LEAVES WHEN ISRAEL BECAME A NATION ONCE AGAIN IN 1948. Though actually a very old nation, she was a reborn as a new, young nation. Renewed like the eagle. The above prophecy was fulfilled! In the 6-Day War back in 1976, Israel gained back even more ground. The last time before that in which she conquered anything in six days was when Jericho fell after marching around it for six days! For the first time since before Jesus walked this earth, JERUSALEM WAS NO LONGER UNDER THE FEET OF GENTILES. Now, it is not completely theirs….yet. The Temple Mount—the hottest property on planet earth—is still under the control of non-Jews. THIS IS ABOUT TO CHANGE, quite suddenly and violently I’m afraid. Ah, yet another prophesied event that will happen…and Oh look!…..it’s LONG AFTER 70A.D. Here is another event that is still future. (I lost count how many events that is.) The church will not see all this happen because Jesus will have “snatched us up” out of the world. We will not be here when the worst troubles hit planet earth. We’ll be in heaven with Jesus looking down. As Daniel prophesied in chapter 2 of his book, there will be a fourth and final kingdom to emerge on the world scene. The toes of the giant statue made up of iron—representing dictatorial or tyrannical governments, and clay—representing democracies will form that final kingdom. They are already in existence. We also won’t see them all form into the United States of Europe of the revived Roman Empire. The AntiChrist will arise from them. He will rebuild the temple in Jerusalem and be it’s next occupant. Daniel wrote in Chapter 9 his famous “seventy weeks of years” prophecy, and a very cryptic one it was…..until now. “Weeks of years” is a literary form know as a “Hebraism.” One week is “seven years.” How do we know that? Remember way back in Genesis when Jacob was tricked by his father-in-law, Laban? He worked for him for seven years thinking he would get to marry Rachel, whom he loved. The only problem was, he ended up getting Leah, her older sister, instead. He was understandably a little upset! Prophetic Of The Triumphal Entry. True to Daniel’s prophecy, when Jesus rode into Jerusalem on that donkey, it was exactly “week” 69 of the “70 weeks of years.” But because Jesus was rejected, God’s prophetic time clock stopped right there: At 69 “weeks”…..and holding. That leaves one more week to play out which will happen when God’s time clock begins ticking again toward the end of time. The last “week” will be the seven years of the great tribulation. Despite her rejecting Jesus, God still showed Israel GREAT MERCY by extending to her a 40-year grace period after He ascended to His Father which ended in 70AD. But they continued to reject Jesus. So at the end of that period, God moved out of the temple. Without His protection, General Titus was able to destroy it, though that wasn’t his intention. You see, He had commanded his troops NOT to destroy it. It was such a beautiful building. Quite uncharacteristically, some of his troops disobeyed his order because they wanted to get their hands on all the gold. As the temple burned, the gold melted and ran between the stones bringing down the entire structure. Just as Jesus prophesied, not one stone was left upon another. To this day, you can see them in the valley below where the temple stood. After it fell, the Jewish people were scattered into all the nations of the world and remained dispersed for 2,000 years. Then suddenly, precipitated by the horrific events of WWll, everything changed! The United Nations, in an unprecedented move, much to the shock and surprise of the whole world, voted to give the Jewish people a homeland. She became a nation once again in 1948. Please refer to the link above about “The 19th Book” for more on that story. You and I, Church, are the generation that will hear our Jesus shout from mid-sky, “COME UP HERE!” The dead in Christ will rise, those of us who are alive and remain will be changed and we will be with Him FOREVER! So fear not: Look up, Church, for your Salvation: Your “Y’Shua,” draws near! ← No More Double Talk, Please.